Our cotton bolsters & seats are used in Indian Tents and also Arabian Tents for hookah party & as mujrah seating too. In tents we generally prefer low floor seating, for this purpose foam seats and cotton bolsters are generally used. You can buy cotton bolsters, bolsters covers in cotton fabric with hand block printing, raw silk covers with golden laces and patch work, cotton cushion covers, and raw silk covers from us. It is a very traditional custom in Indian weddings to sit on foam seats and rest back on bolsters while performing the wedding rituals and Puja. We make Foam seats and bolsters for heena and mehndi ceremony, sangeet ceremony and other pre-wedding functions in Tents. 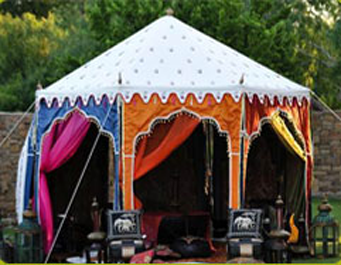 We also make all types of tents accessories and “Furniture for our exclusive Indian Tents. Our cotton bolsters, designer velvet cushions and raw silk cushions and so much in demand in the United States and Europe for their rich and traditional look. The new addition to our tents accessories is our designer cushion covers, velvet cushion covers in maroon color with golden hanging fringe on the edges. 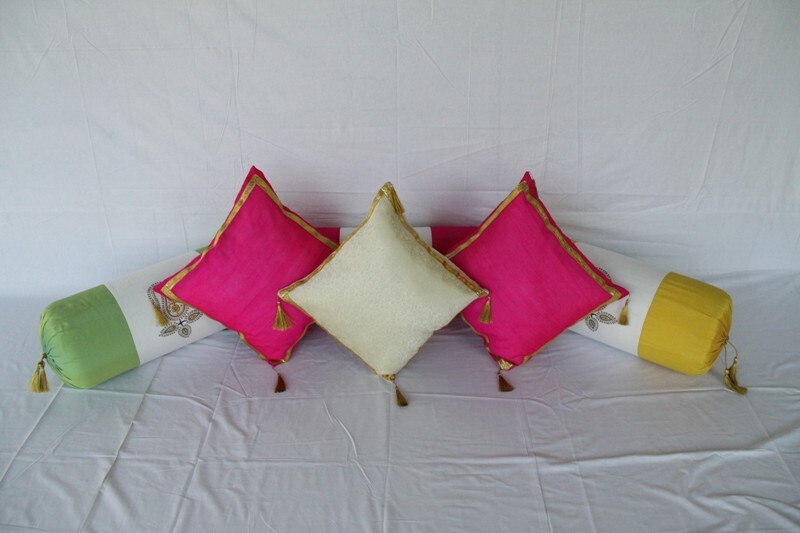 Our raw silk cushions in very bright and vibrant colors are also a part of our best sellers range of cushions & bolsters. We also do Lamps and Lanterns lighting for Tents and Marquees.